Ip Man and the Prostitute: Female Sexuality as a Weapon in Traditional Chinese Martial Culture. A classic postcard, circa 1920s. Introduction: Masculinity as a Core Value in the Traditional Southern Martial Arts. One of the few facts that everyone seems to “know” about Wing Chun is that the art was created by a female. Whether this is actually true or not has no bearing on the current discussion. Instead what is important is that so many martial artists believe this to be the case. Not many other Chinese arts share this distinction. White Crane in Fujian (which may or may not have a connection to Wing Chun depending on who you ask) is also said to have been the creation of a talented female boxer. Boat Boxing (also from Fujian) is reputed to have been developed by the wives of fishermen to defend themselves against the onslaught of pirates that infested the waterways of southern China for most of the late imperial period. Female warriors also play an important role in the martial mythology of Yunnan Province, located at the very edge of the Chinese cultural sphere. Nor can one discount the literary power of figures like Hua Mulan. But these examples, as interesting as they are, are basically the exceptions that prove the rule. The martial arts of southern China were a man’s world, both symbolically and literally. The vast majority of martial artists in this period were male. Exceptions did exist, but they were rare. Further, the creation stories of the region’s martial arts are dominated by male figures, often with some connection to the Shaolin Temple. In fact, this claim to a monkish origin is one of the sociological markers that we use to identify the “Hung Mun” arts of the Cantonese speaking majority. Female heroes might appear in fictional stories, but they were a point of interest precisely because they were rare. The ways in which female characteristics and traits (or anything associated with the idea of “Yin”) were viewed in 19th century Chinese popular culture was different from how your average western martial arts student might think of the same topic today. This then raises some very interesting questions. To begin with, when people heard the stories of Yim Wing Chun, or Fang Qiniang, how did they interpret them? What sorts of meanings did they attach to them? There is no easy way to answer this question. The story of Yim Wing Chun is still popular today because it has fictive (transformative) power in people’s lives. The ultimate origin of this power is based on human psychology. 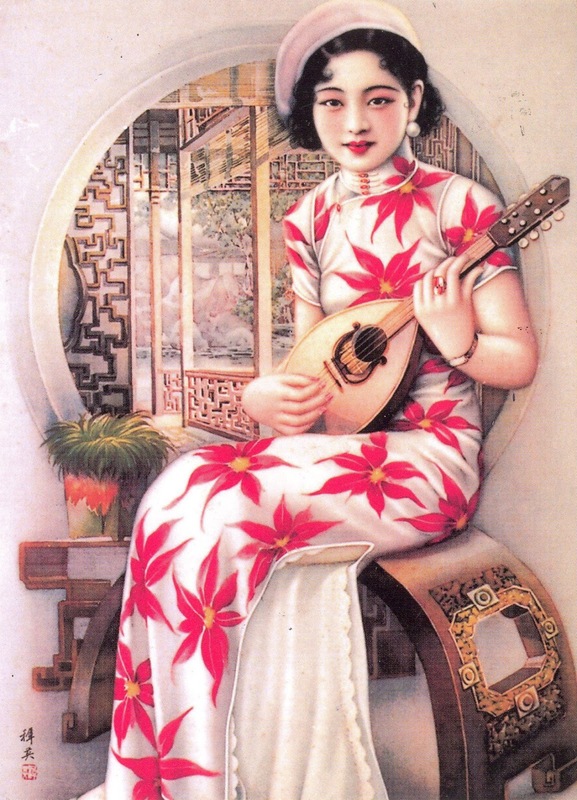 In this story we are presented with a classic “rite of passage.” Listeners are told how an immature, weak, virginal girl was turned into a powerful adult female, capable of returning to her home and getting married, because of the intervention of a guide who led her through an adventure set in the hazy dreamscape of south-western China. The psychological appeal of this story is universal. Individuals from all cultures have to navigate basically the same life-pathway that we see laid out here. It is no wonder that it has been so successful with modern audiences. Still, as the anthropologist Victor Turner pointed out, good symbols are always multi-vocal. They have more than one interpretation. In different situations they can adapt and take on new readings. As we change we always “find something new” in them. This is why a really classic story or myth never seems to get old, no matter how many times we hear it. When we move into the realm of symbolic analysis we also take a step away from the universality of basic psychology towards the particularism of culture. Culture is a shared system of signs and symbols. These signs have meaning precisely because we all agree that they do. Yet meaning can be a slippery thing. So what does the story of Yim Wing Chun look like in cultural terms? “Yin” as an Aspect of Balance: Yim Wing Chun and Feng Qiniang as Model Heroines. Again, this is a tough question to answer as stories tend to be told at specific times, and to specific audiences. During our period of interest all of that was starting to change. New groups were coming into the martial arts for the first time, and they were bringing new ideas with them. And the older groups did not totally disappear. They remained and became part of the mix. As I have argued in other posts, the Yim Wing Chun story that we currently possess probably dates to the 1930s. It is dependent on names and literary characters that did not actually appear in Chinese literature and publishing until quite late. However, the basic sort of female hero that Yim Wing Chun represents is much older. Consider for instance the story of Feng Qiniang. According to Fujianese fighting manuals authored around 1800 (preserved and later rediscovered in Okinawa, where they played an important role in the creation of Karate) Feng was the creator of Yong Chun (Wing Chun in Cantonese) White Crane Boxing. Her father (and teacher) eventually died from wounds he sustained in a battle over control of a local village. Swearing vengeance Feng dedicated herself to practice and preparation. One day while still grieving Feng was roused by the sounds of two cranes fighting. As she watched she was transfixed by the strategic movements and “entry” strategies of the graceful birds. She noted how they jumped, feinted and used precisely aimed attacks. Getting a pole she decided to scare the birds off but they sensed the proximity of her weapon, easily evaded it and resettled at a different angle forcing her to come at them again. Eventually the birds flew off of their own accord. Feng decided that her encounter with the cranes was a revelation. She combined what she learned from the birds with the “Monk Fist” of her father and derived the physical outlines of the art that is now White Crane. After three years of practice she became a strong and confident fighter who triumphed in many challenges. But she also learned to appreciate the wisdom of her late father. One who cannot find inner-peace or harmony will never master any fighting tradition. To overcome one’s enemies you must first master and cultivate the self. (Bubishi 97-98). I have presented only a brief summary of the story of Feng Qiniang, but it should be enough to suggest many interesting features. This legend has a pretty nuanced and philosophical view of the martial arts for a document dating from the first part of the 19th century. It doesn’t advance any complex Daoist doctrines or practices, but it is remarkably dedicated to the idea of self-cultivation being the ultimate basis of martial success. In that sense it is more reminiscent of books and stories that would be written 100 years later than most of what we read from the period. Obviously Feng is important for those investigating the background of Yim Wing Chun and Ng Moy. In fact, many of the later accounts of Feng either tie her father explicitly to the Shaolin Temple or claim that she eventually becomes a Nun or a female hermit. I think there is a good chance that Feng (who was based on a real person) provided the raw materials that would later be reorganized to construct Ng Moy. The story makes it clear that evasiveness, deception, retreat and timing are all key ingredients in Feng’s style of boxing. These are also all characteristics that are associated with the idea of Yin, or female (receding) energy. 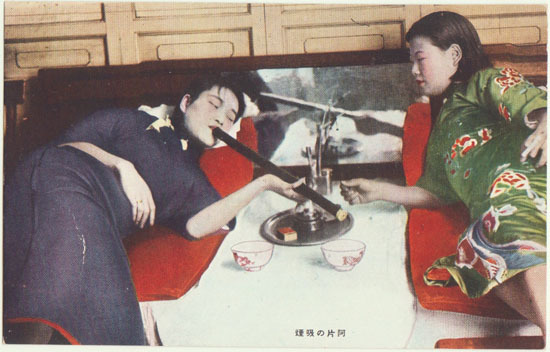 A typical period postcard featuring female drug addicts. This post card was also published in Japan, probably in the 1920s. So, would all Chinese martial artists who heard this story in the 19th century have been receptive to its message? Again, it is very hard to tell but I suspect the answer is no. As Boretz makes clear in his study of martial culture and gender in the region today, “Yang” or masculine (advancing) values are usually seen as the key to success in the Cantonese martial arts. His ethnographic research presents a detailed examination of the role of gender in both southern Chinese folk religion and martial culture. He finds that in practical terms “Yang” is viewed as being pretty much the key to success in everything. It is the Yang forces of fertility that feed the village, ensures the survival of families and brings good fortune. Nor is there much thought of achieving a “balance” here. Generally speaking, the more Yang the better. The concept of “balance” may be important in philosophical Daoism but it doesn’t always come up in folk religion. According to Boretz one of the main roles of the martial arts (from the perspective of folk religion) is to increase and cultivate an individual’s “Yang powers.” Any concentration of Yin is likely to lead to sickness, misfortune or death. Temple processions, exorcisms and even martial arts sets are means of projecting “Yang” into the community to dissipate lingering “Yin” and to ensure prosperity in the future. In his research he notes that martial arts forms or special exorcisms might be performed at street corners where car accidents are common to eliminate the build-up of Yin in the area that is believed to be causing the problem. In short, the view of Yin that Boretz reports in modern folk religion is strikingly at odds with what we read in the stories of Yim Wing Chun or Feng Qiniang. This other discourse on gender is also well attested in the 19th century literature. In fact, I suspect that this was probably the dominant approach to gender seen in the late 19th and early 20th centuries. While reading about the role of the martial arts in the Boxer Uprising (Hat Tip: Scott P Phillips, “Theater, Ritual and Exorcism in Chinese Martial Arts.”), I was reminded of a very colorful set of passages that illustrate popular attitudes towards gender during the Ming and Qing. Before I introduce these, readers should recall that the Boxer movement was made up of both martial artists and impoverished peasants who sought to use an arsenal of traditional charms and spells, as well as whatever weapons they possessed, to eradicate Christianity in China, defend the Qing dynasty, and ultimately drive out the foreigners. Their attacks on Chinese Christians and European missionaries led to foreign military intervention by the western powers and Japan in 1900. “The Boxers regularly attributed the casualties they suffered in fighting with foreigners in Tianjin to the latter’s placement of naked women in the midst or in front of their forces, which broke the power of the Boxers’ magic. The story was also circulated and widely believed by the populace that a naked woman straddled each of the many cannons mounted in the foreign buildings in Zizhulin making it impossible for the “gunfire-repelling magic” (bipao zhi fa) of the boxers to work properly. (Paul A. Cohen. History in Three Keys: The Boxer Uprising as Event, Experience and Myth. Columbia University Press. 1997. p. 131). The Boxers also employed special female troops (the so-called “Red Lanterns”) to try and counteract this (imagined) negative sexual magic being employed by the westerners. Nor was this strategy all that unique. Earlier in Cohen we read about similar strategies being used at other points in the Ming and Qing dynasty. “Dirty water, as a destroyer of magic, was unquestionably related in Boxer minds to the most powerful magic-inhibitor of all: women, and more particularly uncleanness in women, a category that, for Boxers, included everything from menstrual or fetal blood to nakedness to pubic hair. Water was of course a symbol of yin, the primeval female principal in China, and there was a long-held belief that the symbolic representation of yin could be used to overcome the effects of such as phenomena as fire (including gunfire), which was symbolic of the male principal, yang. Several groups of rebels in the late Ming used women to suppress the firepower of government troops. During the insurgency of 1774 in Shandong, Wang Lun’s forces used an array of magical techniques, including strange incantations and women soldiers waving white fans, in their assault on Linqing. The Imperial defenders of the city were at first frustrated by the effectiveness of the rebel’s fighting tactics. An old soldier, however, came to the rescue with this advice: “Let a prostitute go up to the wall and take off her underclothing….we will use yin power to counter their spells.” When this proposal was carried out and proved effective, the government side adopted additional measures of a like sort including, as later recounted by Wang Lun himself, “women wearing red clothing but naked from the waist down, bleeding and urinating in order to destroy our power.” (Cohen, 129-130). We are now in a conceptual world far removed from the fighting strategies of gentle cranes and teenage girls. The earlier discussions of the place of Yin in boxing were clearly related to technical debates about entry, timing and the value short boxing. The examples from Boretz and Cohen place us squarely in the realm of adversarial magic. Rather than being a matter of balance, the forces of Yin are seen as a shadowy harbinger of chaos and destruction. Rather than neutralizing your opponent on the physical realm, the weaponization of female sexuality allows you to attack his virtue and manhood on a much deeper and more fundamental level. I suspect that the stories of Ng Moy, Yim Wing Chun and Fang Qiniang originate in a slightly different cultural milieu than the accounts above. At the end of the Qing dynasty there was an intellectual reform movement within Confucianism that argued (among other things) that the original “goodness” of all people was shared by women. These scholars held that females were moral creatures and they should be treated as such. They were even capable of being educated and might excel in poetry, literature or the arts. This movement was far from anything that we would think of as “modern feminism” and it maintained rigid gender hierarchies. 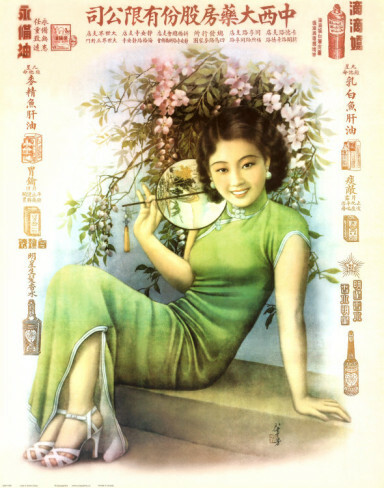 Yet it did have an important effect on the lives of many women including the revolutionary and martial artist Qiu Jin (who grew up in a relatively liberal gentry household). These beliefs are evident in some of the stories of female boxers and heroes told at the end of the Qing dynasty. Likewise these same ideas are remarkably absent from earlier fictional works such as Water Margin. In the more liberal 19th century martial mythology women are typically viewed as fully realized moral creatures, capable of hard work and self-cultivation. There is nothing about their inherent “femaleness” that disqualified them from being a proficient boxer any more than being a female disqualified one from being an accomplished calligrapher. In fact, a lot of the discussion in the Bubishi about the importance of self-discipline and internal cultivation sounds more like a reflection of popular 19th century Confucianism than Daoism when you get right down to it. We often forget that Confucians also used meditation and breathing exercises and were just as capable of medical or metaphysical thought as anyone else. These attitudes on gender were obviously not shared by everyone in society, and even some aspects of modern Chinese folk religion continue to draw a much sharper ontological distinction between genders than most of us in the western industrialized world would be comfortable accepting. Examined from this more reactionary perspective, the story of Ng Moy starts to look very different. Suddenly a lone female figure, manipulating the forces of Yin to skirt the authority of the government and bringing down local “heroes” becomes a questionable role model. In fact, I suspect that this is one of the reasons why a number of lineages in the Wing Chun world today have attempted to create “alternate” creation stories. Rather than focusing on women, which they find to be both embarrassing and “unrealistic,” these schools would prefer a narrative that relied exclusively on male “rebels,” usually in association with an exotic secret society, fighting desperately to take down the government. In short, there is a certain amount of pressure within the Wing Chun clan to ditch our own creation story and to start telling basically the same (male-dominated) story that every other Cantonese martial art uses. It would appear that the multiple possible readings of the role of “Yin” in martial culture are still causing unresolved tensions even in the current era. 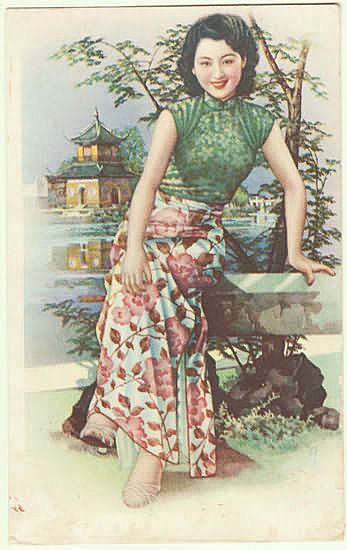 A vintage postcard showing a beauty in a western style dress. Circa 1920. Understanding Gender to Decode History: Yim Hung Challenges Ip Man. These competing popular ideas about gender might provide a useful dialectic for thinking about other issues that occasionally arise in the history of the southern Chinese martial arts. For instance, one of the strangest stories that I have ever heard about Ip Man’s youth is that of his challenge match with a well-known prostitute. Even odder, this story is related by his son Ip Chun, who is not prone to exaggeration, and hence it is probably factually true. As a point of reference, readers should recall that many northern martial artists were starting to come to Guangdong in the 1920s. Some of these individuals came with the Jingwu Association, and others were sent as part of the later Guoshu movement. Still more came independently. This mixing of old and new styles was occasionally a source of tension as teacher competed for students and social influence. 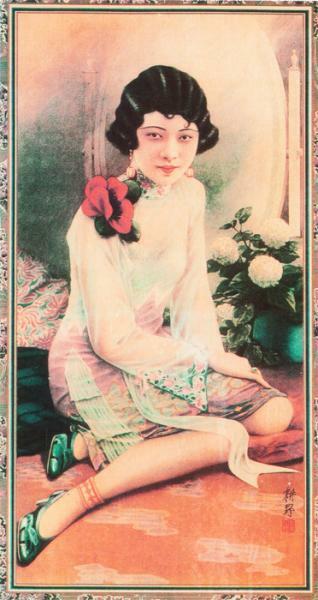 In the 1920s a beautiful prostitute named Yim Hung spent some time in Foshan. She was not a local resident and was originally from northern China. She is reputed to have been a woman of many talents, one of which was her mastery of hard Qigong. This is a practice whereby martial artists condition or train parts of their body to accept punishing blows. Whenever you see a “Shaolin monk” having cinder blocks smashed on his head or boards broken across his stomach during a demonstration, he is doing “hard Qigong.” Such skills were commonly displayed in marketplaces and they were a great way to draw a crowd when selling patent medicines or other services. Ip Man’s friends wanted to test his martial skills (and possibly humiliate him) so they arranged for a surprise meeting between the two at a private restaurant in Foshan. Yim Hung extended a challenge to Ip Man. If she could withstand three blows to her stomach he would have to pay her about $750 in current American dollars. If he managed to penetrate her “Iron Stomach” technique then he could avail himself of her services free of charge. So what is really going on in this story? At first glance it would appear to be a rather tawdry tale about a young Kung Fu master literally beating a traveling prostitute in a local brothel. Not exactly the sort of thing that one usually builds a martial reputation on, or records as a memorial to one’s father. Nevertheless, I think there is some additional meaning we are meant to derive from this story. On the surface this wager appears to be similar to accounts of using prostitutes to suppress the enemy’s “fire” during the late Ming and Boxer Uprising. Given that Ip Man was larger, stronger and also an experienced martial artist, it was exactly this aspect of the challenge that probably made the wager between the two a potentially interesting public contest in the first place. Yet Ip Man, Yim Hung and Ip Chun (the story teller) did understand what was actually going on. On a deeper level things were not what they seemed. Yim Hung, who was by all accounts a beautiful woman, practiced a discipline that is almost exclusively the domain of working-class men seeking to increase their “Yang characteristics.” Ip Man, a male from a privileged background, used techniques predicated on relaxation (a Yin trait) borrowed from a martial art developed by and for women. To an outside observer it might look as though Ip Man’s Yang had been great enough to triumph over the challenge posed by the prostitute’s corrosive pollution (i.e., Yin). But in reality it was the Yin that triumphed, just as popular wisdom might have expected—but not for reasons that they would have understood. The entire story is a paradox that revolves around the disconnect between a thing’s apparent and real nature. This is a hard story to tell. I don’t typically use it with students. I think the only reason that Ip Chun and others feel comfortable passing it on is that while Ip Man defeats the prostitute, he does it in a way that strikes a clear moral victory for her and people like her. One empowering way of reading this story is that he proves it is not necessary to suppress your essential characteristics (especially gender) to be a good martial artist. That is what Yim Hung was actually doing (though she looked feminine on the outside) when she studied her brand of martial Qigong, and it is ultimately why her Qi was damaged. In order to get to this interpretive level it is necessary to know a little about how gender has been viewed in the Chinese martial arts. Late 19th century Chinese martial culture contained multiple competing schools of thought on these questions. We have reviewed two of them in this article. The first school was more liberal and reformist. It saw women as capable of morality, learning and self-cultivation. In this framework female characteristics could be used to establish balance and inner harmony, either through some understanding of Daoism (rare) or popular Confucianism (much more likely). Feminine metaphors then became available for descriptions of specific tactics and certain modes of story-telling. However, older ideas that understood “Yin” in a harsher and less forgiving light did not simply go away. In certain circles they may have even been strengthened. These same ideas are still present in the popular religion of Southern China today. Both casual readers and historians should be aware that there is more than one way to read many of the Chinese martial arts legends, particularly when gender is involved. In the west we tend to rely on psychological readings of these myths, as those are the most accessible to us. However, as the story of Ip Man and the Yim Hung demonstrates, understanding nuance often requires one to be able to see the same story from multiple points of view. Fascinating blog. Thanks for posting it. I am glad you liked the essay. Thanks for dropping by.